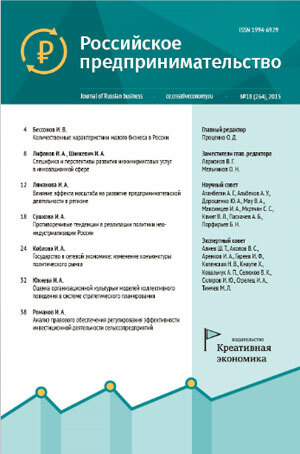 RUSSIAN JOURNAL OF INNOVATION ECONOMICS is devoted to assessing innovations and innovative development in the economic sphere. The journal publishes the results of studies, reviews and reports in the field of innovation economics and innovation management. Please, submit your paper via vinec@creativeconomy.ru. Is digitalization a threat or an opportunity for management development? 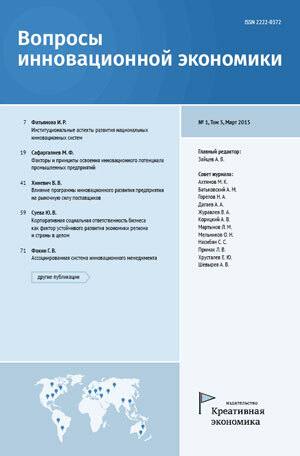 Kovylkin D.Yu., Trofimov O.V., Strelkova L.V., Frolov V.G., Usov N.V.
Kozlova O.A., Kopylova Yu.V., Tagirova A.V. Sayfullina F.M., Mustafina L.R., Semenov D.N. Vavilina A.V, Kalashnikov I.B., Gladysheva I.V. 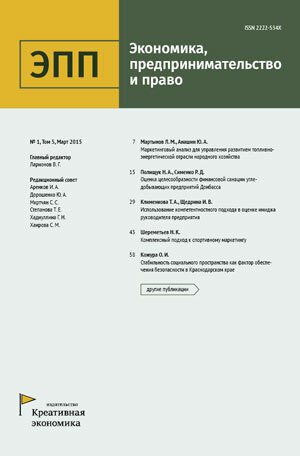 Tortsev A.M., Smirennikova E.V., Studyonov I.I., Novoselov A.P. Starikova M.S., Bezuglyy E.A., Shakhov V.V. Yakovleva E.A., Kozlovskaya E.A., Boyko Yu.V. Varenitsa Yu.I., Kimyaev D.I., Astashev M.G., Varenitsa G.Yu., Gusev V.A., Gusev O.A.